I know lots of people move to New York City expecting high culture. And we do have it. Really. But you’d never know it from reading our newspapers. The New York Times is biased at best and fraudulent at worst, but they can’t even hold a candle to the New York Post and the New York Daily News. Now, while the Post has probably the worst reputation (it’s about one step above the National Enquirer), the Daily News runs a close second in the “tabloid” category (and I’m being kind here). 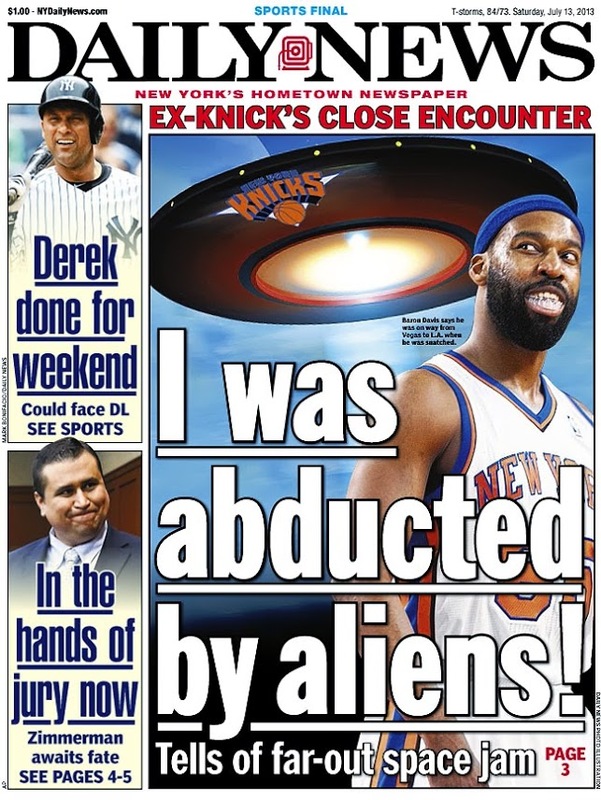 To wit, the front -page headline (yes, this was on the front page of a newspaper in perhaps the biggest city in the world) announcing that former NBA star and New York Knicks alum Baron Davis was abducted by aliens. It was a close encounter of the hoops kind. “I was, um, on my way from Vegas here to L.A.,” he said on the episode that aired Thursday. “I’m a little tired and s— and I see this light and I think it’s a big-a– truck. “Then next thing you know, dude, like, I was in this f—— steel thing,” Davis deadpanned. It was a scene straight out of “Space Jam,” the 1996 film starring Looney Tunes characters, Michael Jordan and a basketball team of aliens. However he had stuck to his story even after podcast hosts Neal Brennan and Moshe Kasher pressed the 34-year-old, trying to get him to admit he was telling a tall tale. “We don’t know if you’re being serious or not,” one of the hosts asked. “Dude, they were poking me on my nose and s—,” Davis replied. The encounter ended, like most wild nights in California, with a pit stop at In-N-Out Burger. “I just got off at the next exit,” said Davis, who noted he has been taking Percocet after knee surgery. 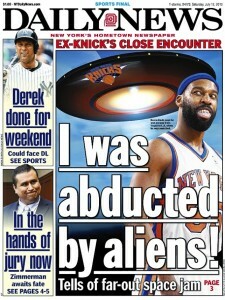 After his extraterrestrial experience, Davis is still flying high. His rep did not respond to a request for comment Friday. But on the podcast, Davis said he has a book coming out about his alien experience. I have read elsewhere that this may be a joke, as Mr. Davis also tweeted, as he was appearing on a comedy podcast while relating this story. That’s all fine and good. I’m just not sure why the Daily News felt that this should be front-page news, while the Zimmerman trial is relegated to a little box in the lower left-hand corner. Thanks to my friend Stephanie McKeon for sending me this story! Will Bigfoot Call Device Lead to $10 Million Prize on Spike TV?